IIM Indore added one more name to the Institute’s alumni authors with the release of ‘Just Married Missed’—a debut novel by Himanshu Bhatia (EPGP 2016-17). ‘Just Married Missed!’ is the journey of a practical arranged crush, chased by crazy filmy love. Sharing the storyline, Himanshu said, ‘Siddharth (Sid) is an ambitious perfectionist. He wants to go up the corporate ladder at a faster pace than his age, and is doing pretty well. In his matrimonial search, Sid meets Shreya, who herself is an IIM graduate and very career oriented. He finds Shreya the epitome of the ‘Beauty with Brains’ tag and develops a crush on her almost instantly. Himanshu, who developed a passion for writing receiving appreciation from family, friends and colleagues, mentioned that he had written more than half of the first draft of the book when he took admission in EPGP. ‘The beautiful campus provided me the perfect surrounding to finish the draft and get the book into final shape’, he said. Starting in 2015, Himanshu has spent more than 30 months in finishing this novel. ‘First book is very special in every author’s life and so is the case with me. This book has helped me come a long way from short poetry to a 230 odd page novel. I hope this would provide me the platform that would let me continue expressing my thoughts through the ink and influence the society positively’, he said. 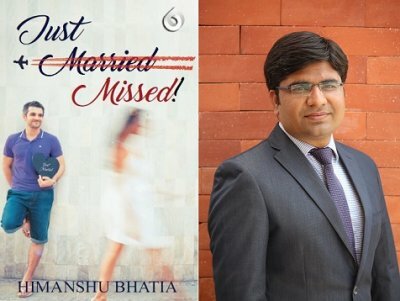 Himanshu’s book is now available online on Amazon.in. The Institute congratulates Himanshu for his novel and wishes him luck for all the future endeavors.